New Community Composting Hub coming our way! Council is establishing a Community Composting Hub at the Koala Park Community Garden. Anyone can get involved by bringing their kitchen scraps to the Koala Park Community Garden! The Welcome and Information Day is planned for Sunday 19 November 2017 (10am – 12noon) when Council’s Waste Minimisation Education staff will explain how the new facility works, how to convert kitchen scraps into nutrients for the soil, and the correct means of disposing of organic food waste responsibly. This facility will be for recycling fruit and vegetable scraps only. Participants can register online now here. By registering, residents can choose to receive a free kitchen caddy (7lt with lid) for storing and transporting waste. These caddies can be collected from the Moorooka Ward Office after registration. The Hub will consist of at least 3 large 220lt composting bins. These will be managed by the Koala Park Community Garden volunteers with dry leaf matter available for layering. The Welcome Day is a FREE event with composting and worm farm displays, free kids activities, and light refreshments provided. You can also register on the day for a free kitchen caddy. It is intended to encourage residents to incorporate composting as part of their daily routine, thereby reducing greenhouse gases and waste to landfill. NO bookings are required to attend the Welcome Day. If you require any additional information please visit Community Composting Hubs. Do you want active and healthy students ready to learn, less traffic at the school gate and stronger school communities? Apply for the 2018 Active School Travel program. Principals are encouraged to apply online now for the 2018 intake. Places are limited and nominations will close on Friday 1 September. Visit Council’s website (www.brisbane.qld.gov.au/activeschooltravel) or call Council’s Contact Centre on 3403 8888 for more information. 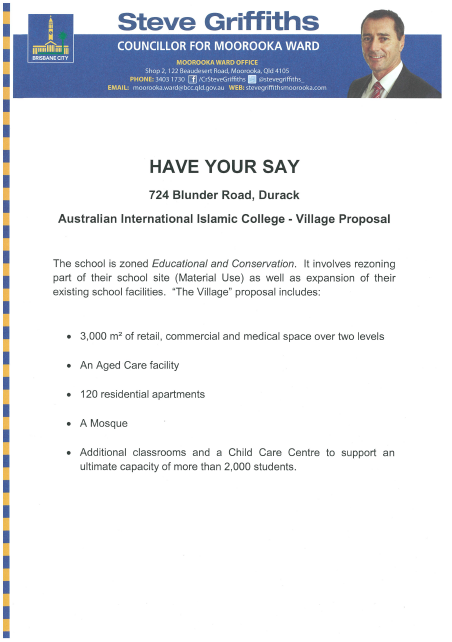 I am pleased to advise that Brisbane City Council has bowed to residents’ concerns over the proposed development of 'The Village' at the Australian International Islamic College at Durack. The proposal was to expand the school from 600 to 2000 students, establish a child care centre, mosque, four high-rise residential complexes, 3000sq m of retail space, a medical centre and an aged care facility. This required significant rezoning of land already zoned for educational purposes. 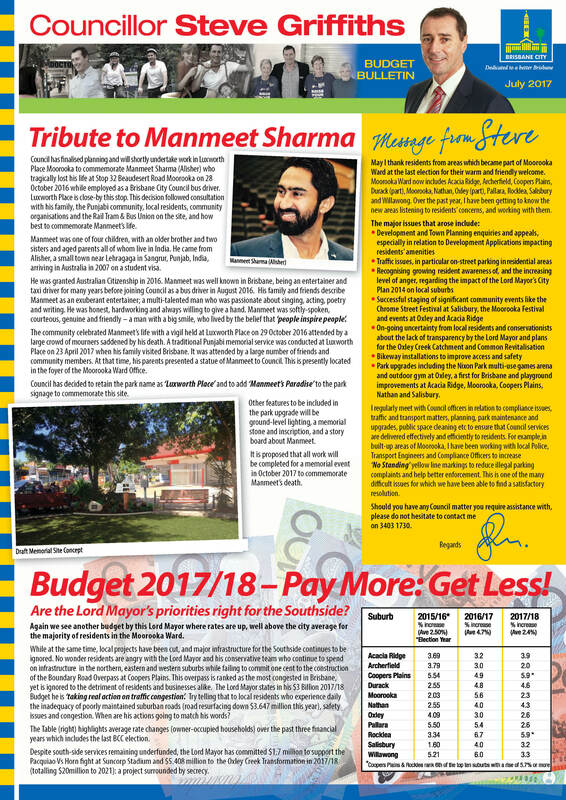 While I supported the expansion of the school and the addition of the child care centre and mosque in line with education use, I strongly opposed the four residential high-rises, the retail space, medical centre and aged care facility. There has been overwhelming support from the community, locally and across Australia, and this has been reflected in the number of submissions and petitions lodged with Council. In short, Council has approved the expansion of the school including the child care centre and mosque; has refused the high-rise apartments and have allowed for rezoning of part of the site for a shopping/medical centre along the Inala Avenue frontage with traffic access to that facility. This, in effect, will allow public access. 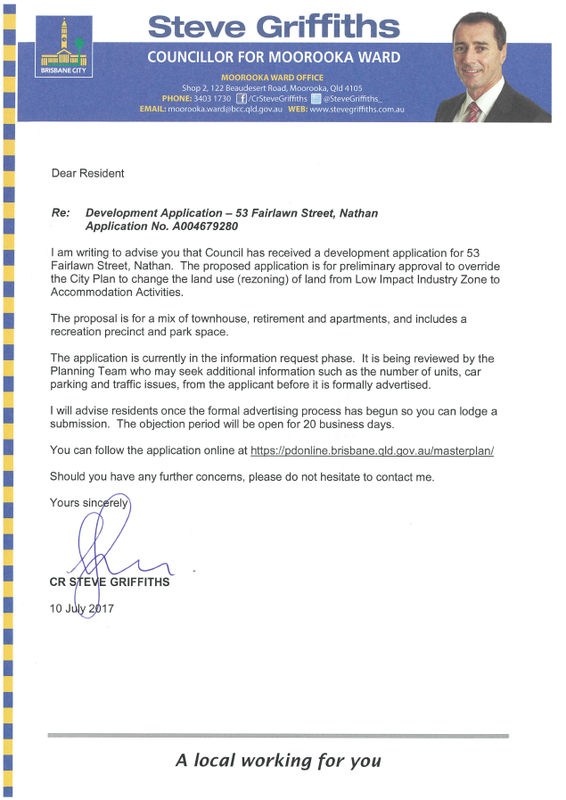 If you wish to view the application online visit PD Online and enter A004061627 into the application enquiry search. Thank you for your support in raising issues of concern such as traffic and safety, and working with me to achieve this outcome. By working together we have prevented a very poor planning outcome by the Lord Mayor and his conservative team. 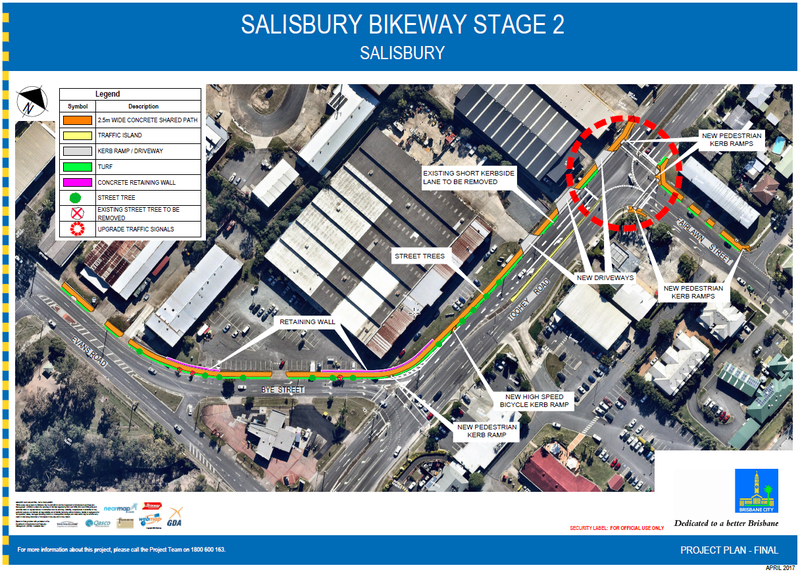 Project update and relevant information for works in Cripps Street, Salisbury being carried out by Queensland Urban Utilites. Work to upgrade the Salisbury dog park is presently underway. This will extend the park, create large and small dog parks with improved access and remove / replace the existing turf. Soil has been removed, ripping has been undertaken to improve water penetration and growth, new top soil added and new turf planted. Rejuvenation of the turf has now been competed although the area will remain fenced off for a couple more weeks to allow the turf to establish. 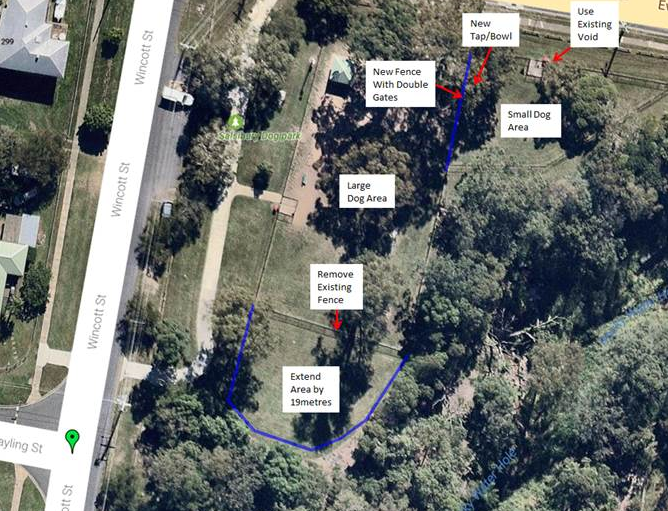 The park is being extended in a southerly direction along Wincott Street to provide more space for larger dogs to run, while a small dog enclosure is being incorporated into an existing area on the north-east side of the park along Evans Road. Fencing to accomodate these changes are expected to commence in the second week of June. 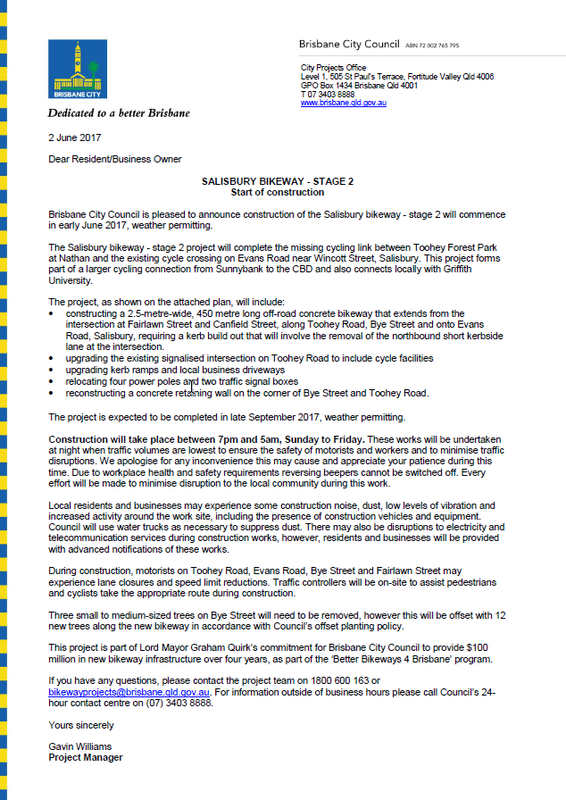 I am pleased to advise that construction of the new BBQ will commence this Wednesday 5 April in Russ Hall Park, Ainsworth St frontage, Salisbury. 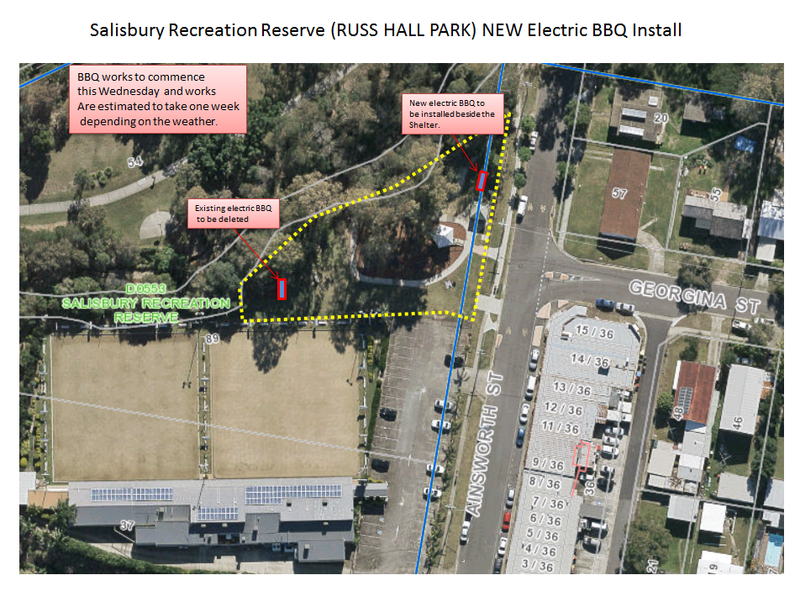 For the safety of park users, Russ Hall Park will be temporarily fenced off whilst the old BBQ is removed and the power is run to the new BBQ. We are trying to minimise the disruption to park users, and works should only take one week to complete, weather dependent.